High-performance forms allow you to sculpt gorgeous Gel enhancements. Provide a perfect, custom fit with strategically placed tabs and perforations. For natural-looking enhancements with a clean deep "C" curve and no seepage. PERFORMANCE FORMS® provide a perfect, custom fit for sculpting nails with strategically placed tabs and perforations. 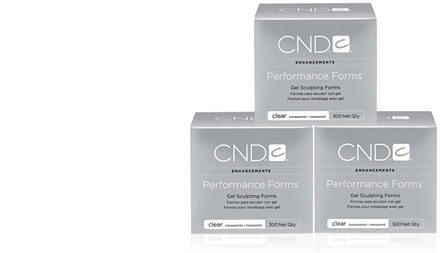 CND® Clear PERFORMANCE FORMS® are for use with gel sculpting systems – BRISA® Gel enhancements in particular. The clear forms allow UV light to penetrate, ensuring a thorough cure. These high-performance sculpting forms create natural-looking gel enhancements with a clean, deep “C” curve and no seepage. Clear Performance Forms come in a 300-count roll, and they’re made to coordinate with BRISA®Gel and the Pro-Series gel brush. Clear Performance Forms are included in our BRISA® Gel Intro Pack. Silver Performance Forms are also available for use with Liquid & Powder Sculpting Systems.